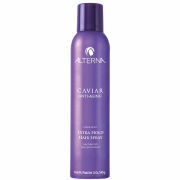 Providing light to medium hold, Alterna Caviar Working Hairspray (250ml) is an ultra-dry hairspray that gives flexible texture, whilst removing at the stroke of a brush. 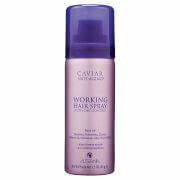 Humidity resistant, your hair will look pristine all day. - L.M. 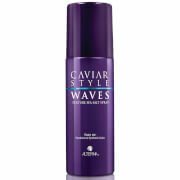 A combination of peptides, polymers and resins creates a structure for extreme weightless volume. Seasilk, a blend of powerful marine botanicals, provides exceptional moisture & helps repair damage. D Alcohol 40-B (Alcohol Denat. ), Hydrofluorocarbon 152a, Octylacrylamide/ Acrylates/Butylaminoethyl Methacrylate Copolymer, Cyclomethicone, Aminomethyl Propanol, Phenyl Trimethicone, Triethyl Citrate, PEG/PPG-17/18 Dimethicone, Pentaerythrityl Tetracaprylate/Tetracaprate, Panthenol, PPG-5-Ceteth-20, PPG-2 Myristyl Ether Propionate, Propylene Glycol, Caviar Extract, Aqua/Water/EAU, Fennel (Foeniculum Vulgare) Extract, Saccharomyces Lysate Ferment, Saccharomyces Copper Ferment, Saccharomyces Zinc Ferment, Superoxide Dismutase, Lactoferrin, Retinyl Palmitate Polypeptide, Phospholipids,Corn Oligosaccharides, Copper Oxidase, Acetyl Methionine, Acetyl Serine, Amino Acyl tRNA Synthetase, Peptone, Hydrolyzed Soy Protein, Glycine max (Soybean) Symbiosome Lysate, Pikea Robusta Extract, Adenosine Triphosphate, Niacinamide Polypeptide (Vitamin B3), Ascorbic Acid Polypeptide, Pantothenic Acid Polypeptide (Vitamin B5), Magnesium Sulfate, Fragrance/Parfum, Benzyl Benzoate, Benzyl Salicylate, Citronellol, Geraniol, Hydroxyisohexyl 3-cyclohexene carboxaldehyde, Alpha-Methyl Ionone, Butylphenyl Methylpropional.